Welcome to a new way of owning a vehicle. We offer free lifetime oil changes, multi-point inspections, engine guarantees, and tire rotations. We also have a rewards program for all of our customers. So, what is the difference then? Well, we offer it to all of our customers, no matter if you bought a brand-new car or used vehicle, absolutely free. That is a $2,800 value that you get for free just for being a customer of the Seth Wadley Auto family! You can choose from our huge selection of inventory on any of our lots. 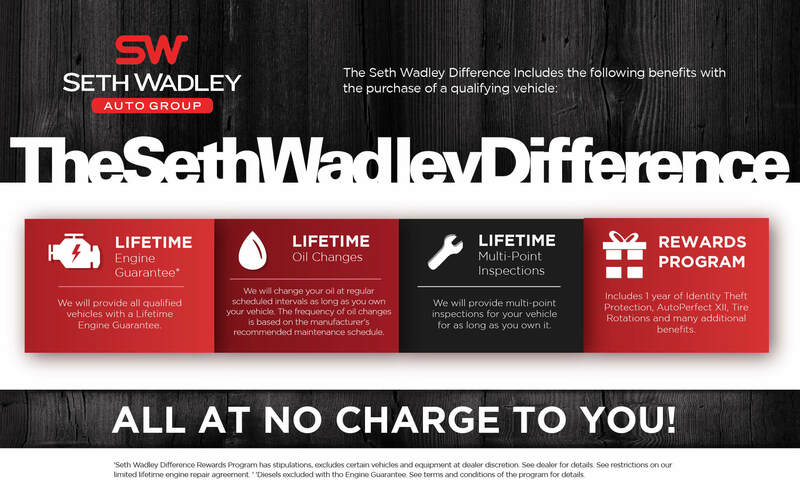 It does not matter if you want a Ford, Chevy, Chrysler, Jeep, Dodge, Ram, Cadillac, or GMC, you are automatically enrolled in the Seth Wadley Difference Program. We are the only dealer in Pauls Valley or anywhere else in the greater Oklahoma City area that offers its customers these kinds of benefits simply for being a customer. That is what makes us different; that is what makes us Seth Wadley. We challenge you to find another dealer who can offer you anything close to the Seth Wadley Difference. In addition to the already mentioned services, you also receive a pre-vacation vehicle checkup, identity theft protection for one year, dent and ding coverage for one year, windshield replacement for one year, free towing for a year, 5 percent discounts on all accessories for your vehicle, and tire coverage for any road hazard incidents. You can extend all of these servicers and choose to become a member of our platinum program for an additional fee. Simply see a dealership staff member for info. With all of these great added benefits, at no charge to you, it easy to see why we are the best choice for your next automobile purchase. With our rewards program, you can enjoy discounts on all of our services and even on your next vehicle purchase. Every time you spend money on a service, accessory, or anything else we have available, you will earn points. These points can be redeemed for anything you want to purchase in the future. It is that simple. Finally, a dealer who rewards their customers and you will only find it at Pauls Valley's number-one automotive dealer: Seth Wadley. The Seth Wadley Difference means that you can finally purchase a new or used vehicle of your choice and have comfort knowing some of the most common vehicle mishaps are covered absolutely free just for being a customer of Seth Wadley. No other dealer even comes close to offering its customers what we offer to you. Find out more about why we are the number-one auto dealer this side of Oklahoma City. Come down to one of our lots today and check out our huge selection of inventory from the top car manufacturers. Our entire inventory of new and pre-owned cars and trucks is available to you, and every single one of them includes the Seth Wadley Difference Program free of charge. It is our way of saying thank you for letting us be a part of your driving experience.